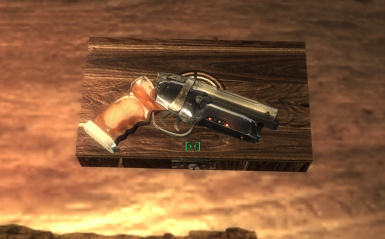 I love being able to use Deckards pistol in fallout! Great mod. I used this for a while then took it out of my load order to make way for something else, but I missed it so much I put it back as my standard sidearm. I do not know whether this is mod related or not; I'd already visited the gun location, made some brief forays elsewhere -then installed the mod (toggled ArchiveInvalidation off and on) and returned to retrieve the weapon. [I use the none-fose, vanilla flavour]. I stumbled into a zombie; someone previously deceased and now come back from the dead (he has a house in Ridgefield). Vanilla bug or mod related? As always: the weapon is an absolute marvel - top notch. Not endorsing this would be criminal. Huh?!! You using MMM? Weird. Not sure myself... I'll keep an eye open for this. It's not related to this mod though. on the offchance that this ever gets addressed, whats the console ID for spawning this thing? 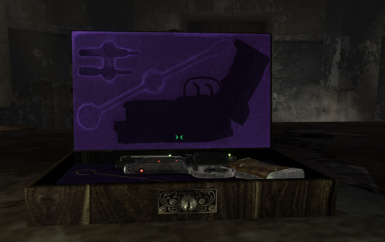 for character reasons, i want to play with it from the vault, and make the ammo the limiting factor, since im already running higher difficulty mods. A bit late, but FO3Edit is your friend for one, knowing the id tag on items that you want to console into your game. 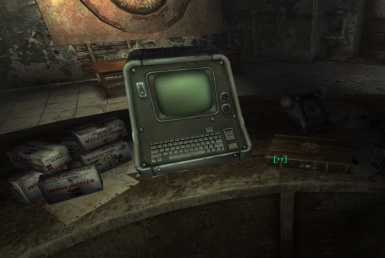 You can use FO3Edit to find out what the console id is for this weapon. It depends on where it is in your load order. 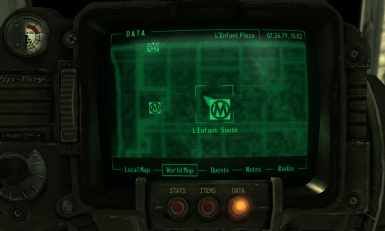 Open up FO3Edit, select all and then hit ok. After it sorts your load... just find the mod and open up it's tree. The code will be displayed for you, in the weapon folder. The first 2 letters/numbers signify where it sits in your load order... the rest of the numbers are specific to the weapon. Silly question perhaps, but how the hell do I find the capital post building? I have looked up the building'd location but no matter where I start from I run into impassable walls of rubble. 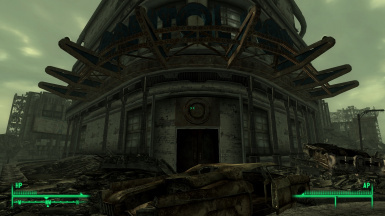 I am replaying Fallout 3 after my first play through at release and recently played Fallout 4, I had forgotten how comparatively restrained the map was. I have not been able to find the L'enfant Metro Station and the only video I could find starts from there. L'Enfant South. That's all you get from me. Curious to see how many downloads you start getting with the release of the new BladeRunner movie. Hopefully they introduce some new weaponry for you to model. Yes, Blade Runner 2049, it was so cool to see the gun in Deckard's hands again in the trailer. Downloads have been pretty consistent around 120 - 130 a month since the initial peak around the mods release. As you say, will be interesting if the new film has an effect. As an old timer who views the original film as a classic, I was always shocked how many did not realise the gun is from Blade Runner! Even had a few who thought I pinched the design from That Gun in New Vegas. Good to see you're still about! Yes, downloads did spike in October around the release of the new film. Sept had dipped to 90 downloads, the lowest since uploading the mod. Oct leapt up to 183, the highest since the initial release months. Well, it's as easy as clicking on the "Stats" tab. Nexus kindly provides the graphs so might as well use them. 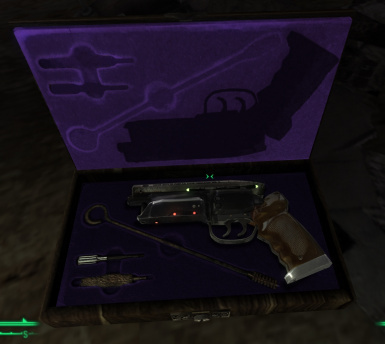 I loved this gun in New Vegas, I love it in fallout 3. Nice wokr Prensa. 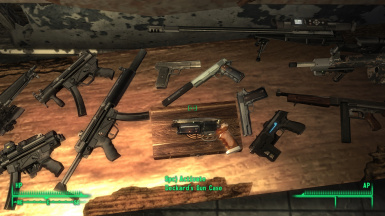 "I loved this gun in New Vegas, I love it in fallout 3. Nice wokr Prensa. " Thank-you kindly, glad you like it! 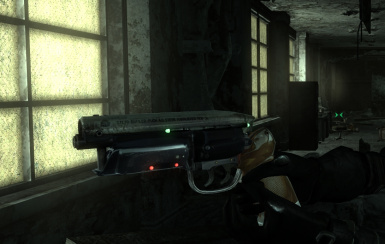 Deckard's gun is such a cool design & fun to "Retire" Super Mutants with. "Will the special ammo spawn randomly in crates or on bodies, or is it shop only?" The custom .44 S&W Special ammo is shop only, Craterside & Flak 'N Shrapnel's specifically. 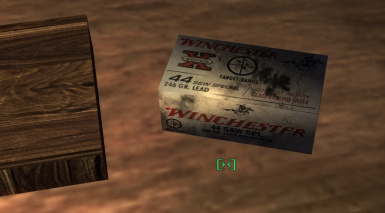 The "vanilla .44 ammo" versions are included for those that find that a bit restricting or just like vanilla ammo only. How do I install this after download? 0uo Please PM me. "How do I install this after download?" Installation is straightforward, choose either "BladeRunnerDeckardGun Vanilla Ammo" or one of the other versions under "Main Files" depending on which ammo you want it to use & FOSE preferences. Use only one of the main files. There's also an Optional Red Light Reload file, instructions also included in the mentioned section. RHIronSight patches also available but no need to worry about them if you do not use that mod. 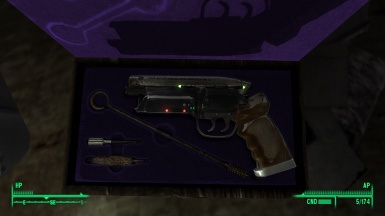 I would love to see an energy version of this gun. To me that would be like a steampunk energy gun after 100 years of technological advancement. Less Tesla but also less Star Trek like. In other words keeping with the ideology period technology to create non period weapons and items, 100 years later than the Victorian would mean that an energy weapon would look more like a standard bulistic weapon but with lights and do dads that indicate it isn't. At least, that's what I would imagine things to be in a steampunk like universe. "I would love to see an energy version of this gun." Interestingly in the movie, from which this is based, it's not entirely clear whether Deckard's gun is energy based or uses conventional ammo. It appears to have two barrels, though only one is hollow with the upper being sealed & thus possibly an energy emitter. There's also a magazine still included as well as the revolver cylinder. Possibly intended as a power pack as it has an on & off switch & power lights. The cylinder is also hidden in the film so may have never been intended to be seen. So it's left to speculation as to what type of ammo. In the end I went for the ammo of the revolver upon which the model was built. "At least, that's what I would imagine things to be in a steampunk like universe. " In many ways your ideas are actually reflected in Blade Runner's design ethic. Everything in the film is old with modern/futuristic items added on top of existing tech. Giving the world a lived in "make do & upgrade what you got" feeling rather than a pristine high tech environment. 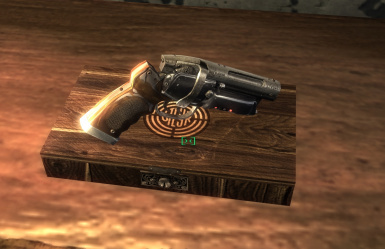 That's why Deckard's gun has much of the feel of an old world revolver.